Mystery snail is an ideal candidate for ornamental fish bowl. It is docile, hardy and easy to maintain for a beginner. In aquarium trade a number of ornamental aquarium species are available and all are being clubbed and known as mystery snail or apple sneil. 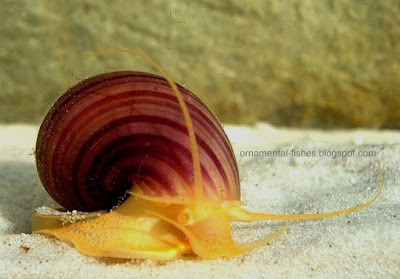 Here we will deal with the most popular, true mystery snail, Pomacea bridgesii belonging to the family Ampullariidae. Mystery snail is native to South American countries of Brazil, Peru, Bolivia and Paraguay. Its availability in wide range of colours and ease of care, makes it a preferred ornamental pet at homes. These beautiful and colourful ornamental pets can be kept in a fish bowl. Depending upon the size one or two of them can be kept. If the container is fitted with aerator one or two small fish like guppies can be kept along with mystery snail. The container must be covered well as it may crawl out of it. They are active in the night when lights are off and crawl all over the container. The water must contain sufficient calcium and the pH must be above 7. In acidic waters the shell will get eroded and the mystery snail may die. In colder regions a heater may be kept in the container. Normally their life expectancy is about two years and in warmer waters they are active, grow faster and have a shorter life. They should not be kept with bigger fish as they may be pecked and teased. For the formation and growth of shell it must be fed with high calcium food as well as lime must be added to the water periodically. They also takes up the role of scavenging the container for detritus, remnants of feed and the the algal growth. They can be fed with algal food, pellet food and boiled vegetable matter. Unlike most of the other species wherein hermaphroditic forms are common, in these ornamental Pomacea bridgesii species the sexes are separate. They may breed in ornamental fish bowl and the female lays a cluster of eggs on the water margin. The eggs hatch out in 2-3 weaks. The babies also will feed on the detritus and grow.